The MSWA Ride is heading to the Great Southern Region of Western Australia. Have a go in the scenic town of Albany, and put your body "on the line". 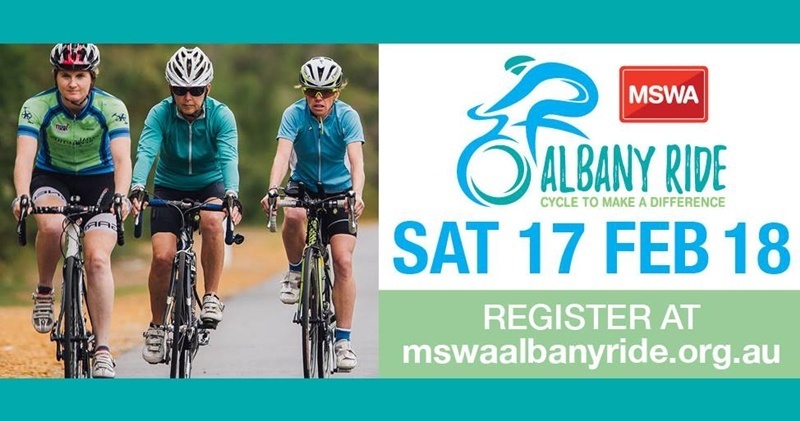 The inaugural MSWA Albany Ride is taking place on Saturday, 17th February, 2018. There are ride distances to suit everyone including families, beginners, weekend warriors and experienced amateur cyclists. The track will meander amongst some of the most beautiful scenery in the Great Southern region, starting and finishing at Emu Point. There will be a family-friendly finale zone at the start/finish line, where you will be able to join in and celebrate together, and help to raise vital funds to support those with MS and all neurological conditions living in Albany and the Great Southern region. Register your interest at the MSWA site. This one is more than an endurance ride – it is a 500 kms cycle through the South West to support WA families living with cancer. You can ride for one section, or if you are fit and able enough, ride in all four! This will be held from 25th February to 4th March, 2018, and you can find details of the four sections at the Red Sky Org site. Your registration includes accommodation, food, kit and support crew. DISCOVER YOUR CITY IN A NEW LIGHT! This is a bike ride to "illuminate the streets of Perth" and it will be held on Saturday, 17th February, 2018. The ride will be in aid of "Cycling Without Age" and you will visit some of Perth iconic locations and landmarks, all with regular stops for entertainment, food, music and more. This ride starts at the Riley Oval, at the University of Western Australia from 8 pm and you will be with hundreds of other riders riding on the streets of Perth. Luminocity – Night Ride Perth is a ride like no other, and is presented by Bicycling Western Australia in support of Cycling Without Age. Register at the Luminosity site, where you can see pricing and bike hire details. This is a challenge that lasts for five days, and it will be unforgettable days of mountain biking that will see you take the route of the golden pipeline from the WA Goldfields, right through to the forests of Perth's hills. This one is for a good cause, and that is supporting young people experiencing homelessness. This can be done in a team as part of a relay style as this would be much easier, and probably more fun than doing it all alone! However, if you are fit enough to ride the whole distance of 600 kms by yourself, then you must register as a solo rider. This will be on from the 5th to 9th May, 2018, and you can find out more information, and book at the Youth Futures site. The Kalamunda 100 provides one of Perth's most challenging rides through the hills of Kalamunda, Pickering Brook and Mundaring. This one is designed for those of you who are fit or who want to get fit. Kalamunda offers an undulating course with challenging climbs and thrilling descents, and there are two different distance options in this event. You can once again register as an individual, with your riding partner or in a team of up to nine riders. This will be held on Sunday 25th February, 2018 with start time at 6.30 am, and meeting at Pickering Brook Sports Club. You can find out all about this event at the Bicycling Western Australia site.